There’s been a wobble and a shift. The wobble came from David Cameron. Ahead of the strike, dubbed J10 by activists, the prime minister was talking tough: the Tories would bring in tougher anti-union laws and would even legislate to ban strikes by public sector workers, he promised. Cameron, with one eye already on the general election, might have thought this a vote-winner. It wasn’t. Opinion polls showed that the public supported the strikers. A survey of over 1,000 people for trade union Unite – whose local government members were out on 10 July – found that 58% thought council workers deserved an extra £1 an hour. Even more – 70% – believed workers had the right to strike over pay. The strike day was a great show of strength, with good picket lines and marches and rallies of thousands around the country, including up to 20,000 in London, 7,000 in Liverpool, and rallies of between 1,000 to 4,5000 in Exeter, Huddersfield, Newcastle, Hull, Nottingham, Leeds, Birmingham and Bristol. Two and a half years ago the brilliant 2.5 million-strong strike over pensions of 30 November 2011 was sold out by the union leaders – Unison’s Dave Prentis unilaterally announced a deal and, with the more conservative union leaders dragging down those further to the left, union members’ readiness to take on the government was utterly and demoralisingly wasted. 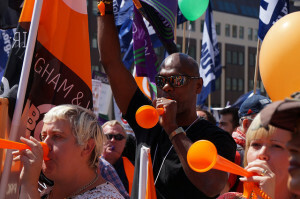 But on 10 July public sector workers showed that despite the huge setback in 2011 they are still up for a fight. Five days later, David Cameron’s reshuffle came around – and here’s the wobble: this was the reshuffle of a very nervous man. Gone was the widely hated education secretary Michael Gove, demoted and replaced by (privately educated) nonentity Nicky Morgan. Former Tory leader William Hague was shunted out of the Foreign Office, among the other major casualties. In came a stream of lesser spotted Tories – Cameron’s aim appears to be to fight an election with as few as possible of his most-hated side-kicks on display. Maybe the Conservatives’ top team will produce less instant revulsion among the voters if it is made up of people we’ve never really heard of before. The new batch of ministers are sharply tilted to the Eurosceptic wing of the Tories, as Cameron looks anxiously at UKIP creeping up on his right. Out went heavyweight pro-European Ken Clarke, now free to spend more time with his fat cigars. Gove’s departure was rightly celebrated by in school staffrooms up and down the country. Gove was not just the purveyor of Tory cuts to schools and education – he led the militant wing of teacher-bashing, publicly attacking teachers as “the enemies of promise” and “the Blob”. His was the ideologically driven regime that brought us the ludicrous and damaging “free schools” policy. Gove has been opposed all the way. Just as he has laid into teachers, so they have fought back. They have campaigned, marched and NUT members in particular have staged a series of impressively solid strikes. Gove’s anti-education policies remain, but their architect and driver has gone. His departure shows how Cameron has been forced to take a step back. The press reported polling figures that showed support for the Tories among teachers had more than halved, from 33% to just 16%, since 2010 – and there are many hundreds of teachers and school support staff, in every parliamentary constituency. In a battle between Gove and the teachers, Gove had to go. Gove’s sacking was not the only sign of Cameron’s wobble. With less public attention, the FBU’s London region points out that escalation of the firefighters’ rolling strike action has also had an effect – the Tories have quietly done a double U-turn with the firefighters. On the eve of the 10 July strike, fire minister Brandon Lewis reinstated an offer on pensions first made in June 2013 but subsequently withdrawn. The offer is not enough for the FBU – but it was a clear climbdown over an offer that Lewis had insisted was off the table. Then in another U-turn Lewis, who had said he would never meet the union under the threat of strike action, came crawling back for talks with the FBU. Finally Lewis was reshuffled – it took the Tories two days to clarify who the new fire minister actually was. It’s Penny Mordaunt, for really keen Tory-spotters. For FBU members, it’s a vindication of their escalation. Cameron’s wobble is a sign of his weakness. But his government has always been weak – the dismal coalition that no-one voted for. The shift is on our side: it’s a step forward in the fight over public sector pay, pensions, workload and cuts. On 22 July, just a week after the government’s reshuffle Unite, Unison and the Royal College of Midwives announced they would all ballot members in the NHS over pay. This could bring another 425,000 public sector workers out on strike in the autumn, making the strikes bigger and more general across the public sector. A quick question for David Cameron: how well do you think your plan to ban public sector strikes is working, when the Royal College of Midwives – which has never balloted for industrial action in its entire history – announces it too will hold a strike vote? The next day, 23 July, Unison announced the next local government strike date – 30 September, during the Tory party conference. 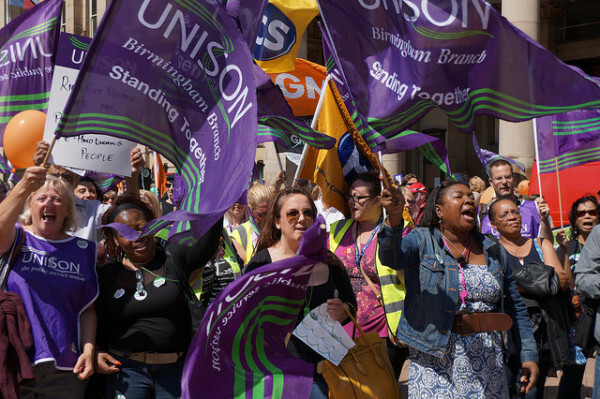 A further council workers’ strike day is likely to be set to coincide with the expected NHS workers strike in October. That could be the date when all the unions now in dispute pile in – the number of workers involved would climb close to the 2011 figure again. A TUC demo, demanding higher pay, is set for 18 October. The past fortnight has highlighted both the Tories’ vulnerability, and the possibility of bigger strikes and a stronger fightback by our side. That is good news all round. IN DCLG, check off for union subs for this month are suspended because of the strike.